Rapid evolution of the automobile industry and the increasing penetration of vehicle & system manufacturers are driving the Asia Pacific automotive ECU market. The overall growth of the automobile industry is attributed to the cheap availability of labor and the decreasing cost of raw materials & electronic components. Increasing automobile production in China and Japan are adding up to the demand for efficient control units to support vehicular functioning. 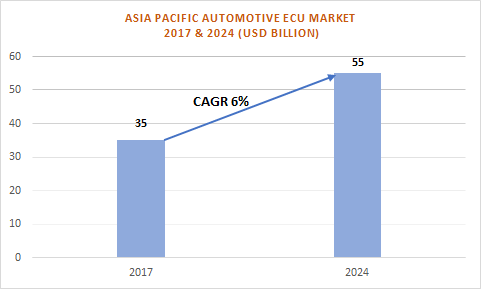 Additionally, the need to incorporate ADAS, safety, and comfort features in all new vehicles to eliminate accidents is generating several opportunities for the Asia Pacific automotive ECU market growth. Autonomous vehicles are expected to experience a fast growth in the Asia Pacific automotive ECU market over the forecast timeframe owing to the increasing road and vehicle safety concerns. The increasing support for conducting research & testing activities from the Chinese Government is a major factor contributing to the industry growth. To address such high requirements of self-driving vehicles, automakers need efficient ADAS and safety systems, further creating a demand for control units in the Asia Pacific automotive ECU market. Moreover, the integration of other safety components such as airbags, advanced brakes, and crash alert systems in semi-autonomous vehicles also add up to the industry expansion. In the Asia Pacific automotive ECU market, battery-operated electric vehicles are gaining a high demand due to the implementation of efficient powertrain & engine management features in such vehicles. The growing need to control environmental pollution caused by vehicles and carbon emissions add up to the consumption of BEVs in Asian countries. Moreover, high fuel costs in countries including China & India are contributing majorly to the production and utilization of electric & battery-operated vehicles. As a result, the need for efficient in-vehicle communication and energy saving systems is generated, which further creates a high demand for control units. These factors along with the growing popularity of EVs are accelerating the industry demand. Prominent companies present in the Asia Pacific automotive ECU market comprise Atmel Corporation, Broadcom Inc., Bosch Group, Delphi Technologies, Denso Corporation, Continental AG, Lear Corporation, ZF Friedrichshafen AG, Hyundai Mobis, Texas Instruments, Hitachi Automotive Systems, etc. The key players focus on developing product innovations by investing in R&D capabilities. These players concentrate on providing efficient control units to OEMs and develop supplier & customer partnerships to strengthen their industry position.